Upward Facing Dog (Urdhva Mukha Svanasana) is always performed in conjunction with adho mukha svanasana. So, most of the time, both the poses follow one after the other. While the former asana is known as the upward facing dog pose, the latter is nothing but the downward facing dog pose. As far as the upward facing dog pose is concerned, it involves bending the back and strengthening the spine, torso as well as the arms. Once the individual has attained the pose, he would be able to enhance flexibility when he proceeds with the Sun Salutations / Surya Namaskar. In Sanskrit, the pose gets the name from the words, Urdhva (upward), Mukha (face), Svana (dog), and asana (pose). So, before moving on to the steps for the asana, let’s take a look at its benefits. 3 Who Shouldn’t Practice the Pose? 3.0.1 Was this article helpful? The back bending pose offers plenty of health benefits to individuals. To know more, you can scroll ahead and check for yourself. 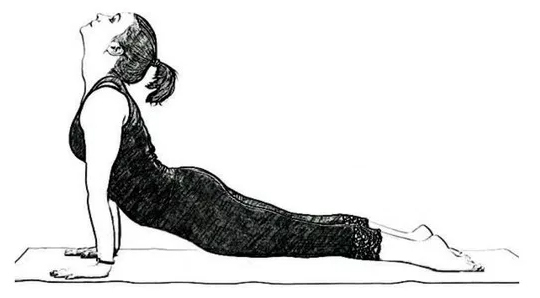 As you get into the pose, you would be stretching your chest and the spine. At the same time, the asana focuses on adding strength to the wrist, shoulders and the arms. The body posture is considerably improved as you open up the upper body and the chest. Since it’s obvious that you would be expanding your chest, the upward facing dog pose helps to get rid of respiratory problems. If you are facing any trouble to inhale and exhale air due to asthma, then the regular practice of the pose can certainly help you. If you have been through a lot of stress, then it’s better to practice the asana the following day. As you try to bend the back as much as possible, the pose rejuvenates the body and relieves you from fatigue. You no longer have to rely on medicines if you are depressed at some point of time. While you practice the asana time and again, the organs around the abdomen would be stimulated considerably. This helps in enhancing the digestion process and in keeping the person away from bowel irregularities. As you would be stretching the spine at an obtuse angle, you would be relieved from a backache over a period of time. In fact, you would be finding a great way of alleviating pain without relying on painkillers. Without any doubt, you would always be able to enhance flexibility with the asana. But, as you lift the upper body with the support of your palms, you should proceed with the step gradually. In case you’re hasty in carrying out the step, then the muscles may strain to some extent. As you feel the energy flowing across the body, the asana stretches most of the muscles. This, in turn, helps in enhancing the blood circulation and in helping the white blood cells through the body. Later, the WBCs are capable to fight invaders in the most effective way. Once you are able to sustain the weight on your buttocks, the asana would be able to strengthen the region. This would actually add on to the vibrant personality while you strive to stay fit and energetic. Soon after you have accomplished in getting into the pose, the set of steps aid in stimulating the abdominal organs. You would be delighted to observe the difference when the stomach, pancreas, liver and the intestines start functioning in a better way. You would no longer have to worry about problems associated with the kidneys and the spleen. Before you move on to get into the pose, it’s important to settle down in a ventilated room. You also need to choose a location where nobody would disturb you. In case you are practicing the asana indoors, then you should open the window panes for letting fresh air inside. Step 1: As soon as you spread the mat, you should lie on your stomach. Later, you need to stretch your legs in the backward direction, with the front side of the feet touching the mat. Step 2: Now, you must bend your elbows and spread your palms on the floor. As you place the palms, ensure that they are closer to the waist and are relatively perpendicular to the floor. Step 3: As you press the hands firmly, you should inhale and try to push yourself in the forward direction. Once you straighten the arms, you should lift up the upper body and legs a few inches above the floor. As you proceed with the step, you should keep the thighs firm and bent inwards. Step 4: Afterwards, you should try pressing the tailbone towards the pubis. You then have to lift the pubis towards the navel and take care of the area near the hips. Step 5: As you attain balance with the shoulder blades, you need to puff the lower ribs forward. Try lifting from the top of the sternum and avoid pushing the ribs forward. You should also look straight ahead but make sure that you don’t compress the back. Step 6: In the end, you should hold the pose for 15 to 30 seconds and release yourself. As you come back to the first position, you need to move with the follow-up pose, Adho Mukha Svanasana. As you proceed with the pose, you should remember to exhale air. Who Shouldn’t Practice the Pose? If you are suffering from chronic back pain or an injury near the back, arms, shoulders, and hips, then you must skip attaining the pose. Since you need to rest on your stomach, the pose is not suitable for pregnant women. Usually, the pose can not only be dangerous after the first trimester but also strain the ligaments as well as the lower back. Moreover, it’s better to stay away from the pose in case you have gone through an abdominal surgery. You should also work steadily depending on your abilities. If you have any health problems, then consult the doctor before getting into the pose.